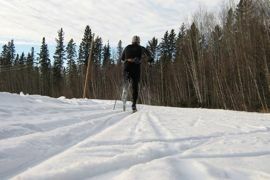 The Ptarmigan Nordic Ski Club (PNSC) is the official cross country ski club in Fort McMurray. Our mission is to promote healthy, outdoor recreation in the city of Fort McMurray through cross country skiing. 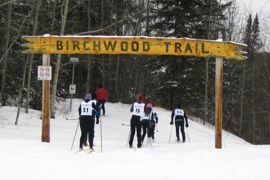 We operate out of the Doug Barnes Cabin in Thickwood and ski in the Birchwood Trails, which is a 35 km trail system in the heart of Fort McMurray. Adult lessons kick off December 6th at 2 pm! Please show up early to collect gear; equipment room opens at 1:30 pm. Computers will be available at the cabin for membership signup or from the comfort of your own home by selecting the link below! The trail map has been updated and a big thank you goes out to Suncor Energy for printing off new brochures for us. These copies can be picked up at the cabin. The map is also available to download from this site.
. Our club is run soley by volunteers so any contribution is greatly appreciated, big or small. The ski club now has a page on Facebook at www.facebook.com/ptarmigannordic . Like us for the latest up to the minute updates on club activities and trail conditions. For those not so tech savy, we will continue sending out the weekly e-mail or check the website here. PNSC is now on Twitter! Follow us @ptarmigannordic for updates on trail conditions, events and more!